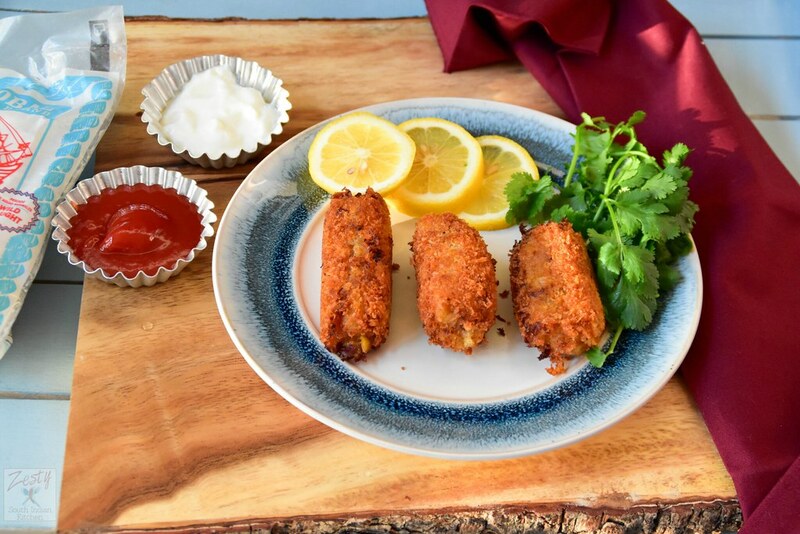 Delicious spicy salted pollack croquettes gives a spicy note to your dinner table. I usually like to make something to munch along with my evening tea or coffee. This is recipe is inspired from my home town fish cutlets as we call it in Kerala, South India. This spicy salted pollack croquette is really nice because you can eat the fish without any fishy smell. I have been received a sample of salted Pollack as a part of CFE international salt fish challenge. My first idea was to make a curry with it, and I tried it, but it turned out to be total disaster. Because again I followed the recipe used in Kerala. In Kerala you can get salted sundried fish, and they usually wash it and rinse for a few times and them soak it for 3-4 hours to remove the salt. Also I was so overconfident that I didn’t read the instructions on the back of Salted Pollack package. It says you need to soak it for over 24 hours and wash few times to remove the saltiness from the fish. If you make a mistake you will learn something isn’t it? Yes I too did that. Then I decide to make these spicy salted Pollack croquettes, and these are easy to make; only need little preparation. Boil the fish and potato separately. Then sauté the onion, ginger-garlic paste, cayenne pepper, Serrano pepper and fish masala. This sauté helps to incorporate the spices into the mixture evenly. If you don’t have fish masala, substitute with your favorite fish seasoning, if not even adding Cajun seasoning will be good. Then add fish and potato to make a uniform mixture. If you cannot tolerate heat use Spanish paprika that makes it less spicy. Once you made the mixture the next steps are easy. First make them into small croquettes then coat them with panko bread crumbs. Then dip them into All-purpose flour and water mixture. Then coat them again with panko bread crumbs. If you want you can use fine bread crumbs and also you can skip All-purpose flour and use egg and water in its place. Shallow fry them in skillet and enjoy. Trust me, it is a great appetizer you can serve with some green salad or you can have just as such. I like to serve with tomato ketchup. 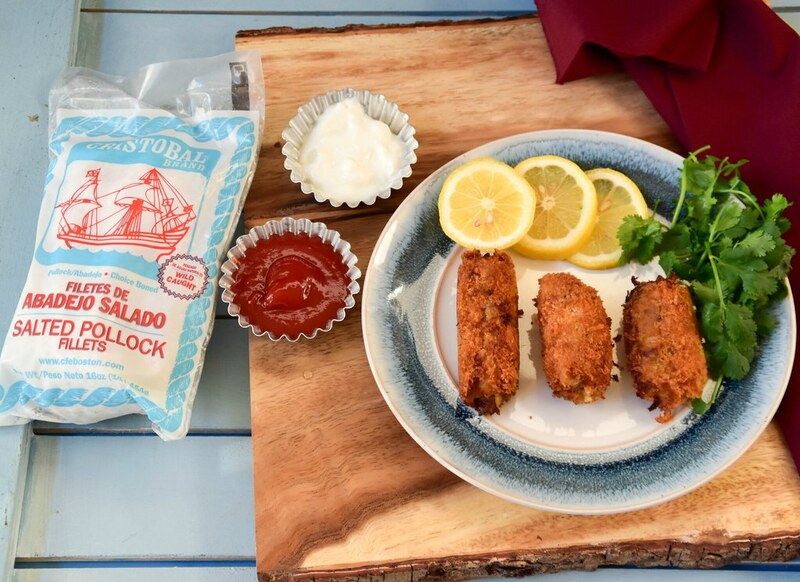 Sweetness from the tomato ketchup perfectly balances with spicy salted Pollack croquettes. 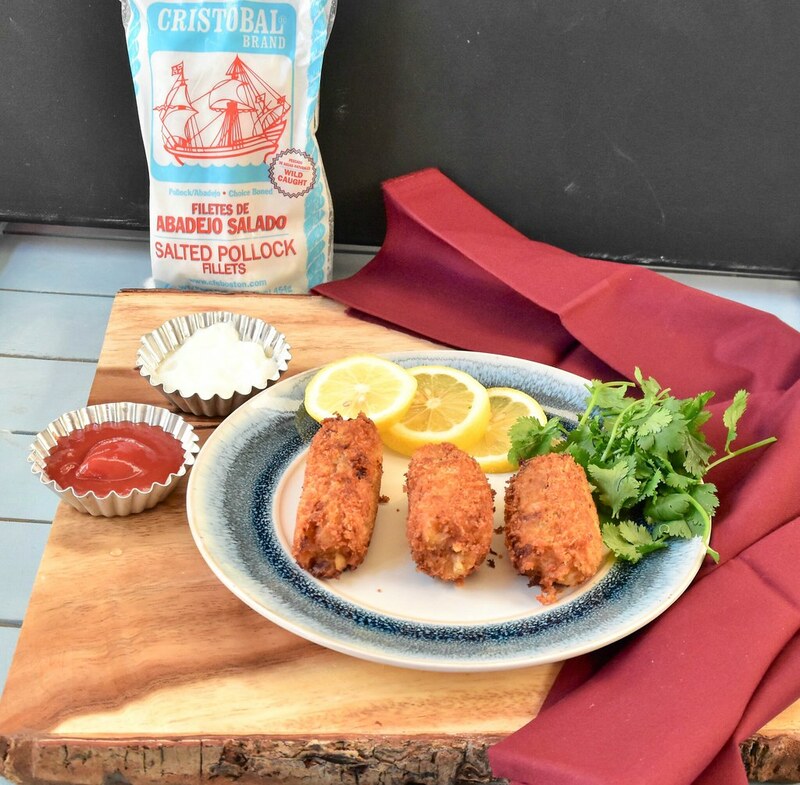 I used Cristobal brand salted Pollack fillets which I received as a part of CFE salt fish blogger challenge. You can pick it from your local grocery store like Wal-Mart, HEB etc. You can connect with CFE International Facebook, Twitter, Pinterest or Instagram. check their products. If you are looking for a great appetizer which doesn’t taste fishy at all then this is it. Give it a try and let me know how it turned out. Spicy salted pollack croquettes are perfect appetizer for any meal. You can serve it as such or with any green salad. ¼ cup peanut oil for frying. First soak the fish in water for 24 hours with 4 or more change of water to remove the salt from the fish. Boil the potato and fish separately and set aside. Heat olive oil in skillet and add chopped onion and serrano pepper cook until onion becomes translucent then add ginger-garlic paste and spice powders like cayenne pepper, turmeric , coriander powder and fish masala. You can use paprika and Cajun seasoning if you don’t want too spicy. Then add fish and cook for another 1 minute and then add mashed potato cook until everything combines well and form smooth dough. Then divide the dough into 11-12 equal sized pieces and hold in the palm and make it into cylinder shape. If you make cylinder shape that will help you to shallow fry them. Then coat them well with panko bread crumbs. Then dip them into all purpose-mixture and roll them in panko bread crumbs once again and set aside. In a skillet heat peanut oil and fry the croquettes make sure to flip gently on each side and fry them until it become golden yellow color. Since I used panko bread crumbs shapes are not uniform. If you use fine bread crumbs it will looks better. Serve with tomato ketchup or your favorite sauce. To this add cooked crushed fish. To this add spice powders cayenne pepper, coriander powder, turmeric and fish masala. Mix well and add mashed potato. Make sure to combine everything to form a smooth dough. Then divide 12 equal pieces and make them into slightly elongated cylinders like this. Carefully place the croquettes and cook them until it becomes golden brown. carefully remove from the oil and drain excess oil using kitchen towel. I received the samples for this post. However all the opinion are mine. Wow…Love this idea. My mom used to make a lot of fish when I was growing up but nothing like this. I probably would have enjoyed this with the potatoes. I think I could convince my kids to try these, I bet they’d love them! I know I would. These look delish! This is such a great idea, I love white fish so this is a recipe that I would enjoy making for sure. Thanks for sharing all the tips! What a fun treat that could be a great appetizer! I love fish and I’m impressed that these wouldn’t have a fishy smell. Must try! 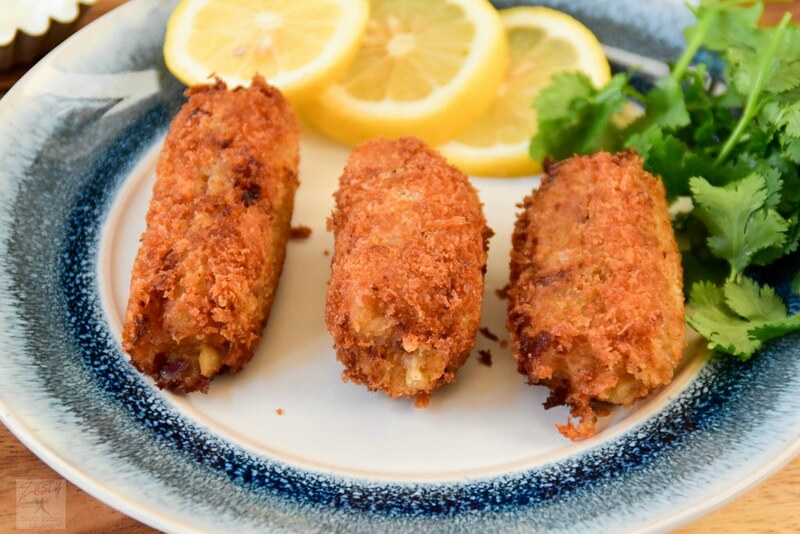 We love fish in our house but my kids fancy these types of fish cakes and croquettes more. Your spice mix sounds so fragrant. Love it. I have never tried salted pollack. We do love making our own version of fish and chips at home. Love the addition of spice. Looks like a great diner. Looks nice and crunchy. I wonder if I could use this same technique with a vegetable. It sounds like it might be like a soft baccala. We have to soak it in fresh water before we can cook with it. We love spicy so this recipe sounds right up our alley. It’s been a while since I’ve seen pollack and I don’t know whether I’ve seen salted pollack. Your recipe does sound delicious. i wonder if I could make it with salted cod?? I’m pinning. 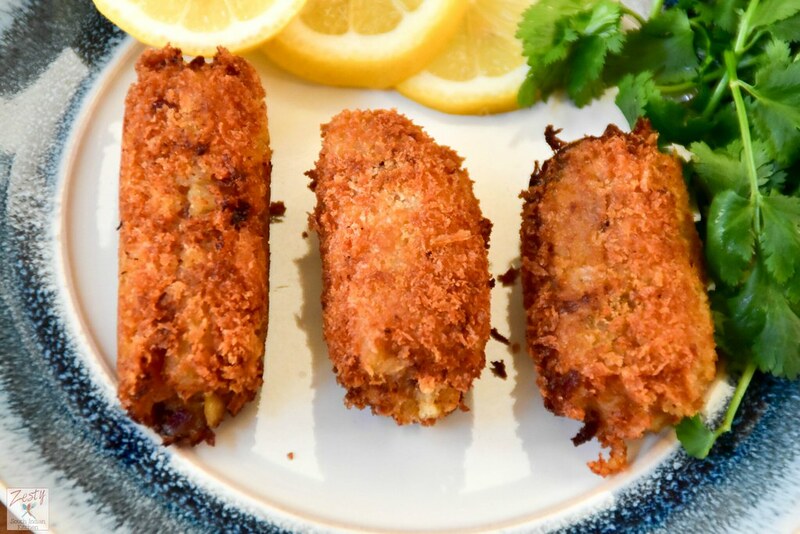 These croquettes look perfectly crunchy and delicious!! Oh my word, I will have a hard time limiting myself to just a few! I’ve only ever had chicken and turkey croquettes but can say that that outer coating looks great. Hubby likes pollack and I’m sure he’d be up for trying these. I can’t comment much on the flavor of the fish as we don’t eat meat, but the flavoring in the croquettes are amazing. My kids love these kinds of quick snack and they would love something similar in vegetarian version. These look so delicious and I love the addition of chat masala or cajun seasoning in it. I’m a big fish eater and bookmarking to try soon. These look so flavorful and the texture looks wonderful! We try to eat fish at least once a week and I would definitely love to give these a try! What a great use of the salted fish..These look really crunchy and great! This sounds perfect. We love to eat seafood on Fridays. My kiddo is a huge fan of croquettes. He’ll be thrilled with this recipe. I love the spices you used, turmeric and cayenne, and masala. This must taste delicious. Great recipe Swathi. Great step by step photos! Seems like an easy and delicious way to prepare. I don’t eat meat anymore but I’ll have to share this recipe with my grandmother. She loves all things salt fish so I’m sure she’d love to try this!